A display showing the varying stages of the helmet-making process for Stahlhelms for the Imperial German Army, 1916-1918. In both World Wars, the most distinctive feature of the Germany army uniform was the item that has come to symbolize German militarism in even remotest corners of the world – the helmet, the Stahlhelm. Here, on a table set up outside a steel helmet factory in Lubeck, Germany, a display is set up, showing the varying stages of the helmet-making process for Stahlhelms for the Imperial German Army. At the beginning of World War I, none of the combatants were issued with any form of protection for the head other than cloth and leather caps, designed at most to protect against saber cuts. When trench warfare began, the number of casualties on all sides suffering from severe head wounds (more often caused by shrapnel than by gunfire) increased dramatically. The French were the first to see a need for more protection — in late 1915 they began to issue Adrian helmets to their troops. The British troops followed with the Brodie helmet. And later the Germans. The man responsible for the design of the German Stahlhelm was Dr. Friedrich Schwerd of the Technical Institute of Hannover. In early 1915, Schwerd completed a study of head wounds that were the result of the trench warfare and submitted a recommendation for steel helmets. He was ordered to Berlin shortly thereafter. Schwerd then undertook the job designing and producing a suitable helmet steel. In some respects, it was an advantage for Germany to have a chance to test both the English and the French types before making conclusive decisions of its own, judging that both designs were far from adequate. Copies of Schwerd’s original pen sketches. The design of the completed helmet included three sections: the dome, the visor and the neck guard. The dome was the main head covering and was cylindrical in shape and somewhat flat on top. The visor extended out to provide shade and protect the soldier against bad weather. It also acted as an open shielded against fragments. The neck guard flared out below the brim, which provided more protection around the neck and ear area. The basic helmet shell is formed from one steel disk, and went through at least nine stamping stages before it reached its final shape. The complete M-16 weighed 2 pounds and six ounces (1.08 kg). The color was field green, and the metal was composed of manganese, nickel, silicon, and carbon steel, which was often referred to as nickel steel. Its thickness was between .40 and 0.45 inches (1-1.15 cm), and it is believed to have been pressed hot on electrically heated dies and later dipped into a mixture of japan for the antirust finish. As a result the Stahlhelm had a greater unit cost than the British helmet, which could be formed in one piece. Helmets were referred to as “shells” when they were empty of any liners and straps. The M-16 shell was manufactured in six sizes: 60, 62, 64, 66, 68 and 70. The sizes were engraved on the inside of all of the shells, and manufacturer’s identification could be found along with it. The inscription was on the left side of the skirt. There were eight factories involved in the manufacturing, therefore, eight different code letters. The head size was never marked in the shell, only the bowl size. It was the metal liner that offered the correct head sizes. The chin strap. All M-16 helmets were equipped with one style of chin strap. The strap was the same type found on the leather spike helmets. It consisted of a strip of leather looped around the two slide buckles and connected to each end by means of attaching “eyes”. These were fastened to the inner side of the neck guard to specially mounted lug bolts. Since the straps were detachable, many were lost, and so replacements were commonly provided. The lining. The lining inside the M-16 helmet offered a cushion and the glove-tight fit necessary for wearing steel headgear. This consisted of a mounting band of leather or steel that ran the length of the inner wall of the shell. In addition to the comfort and the safety designed into the M-16 liner was the ease of changing the fitting. If the soldier felt that the supporting cushions were too hard or thick, he was at liberty to remove some of the stuffing to whatever degree he pleased. Side lugs. No other feature is as recognizable on the M-16 as the side lugs. They stand out and are quite impressive. The lugs served two functions. The first function was for ventilation of the helmet; and second function was to support a heavy armored plate, called a Stirnpanzer. It was thought that this armor would protect sentries and machine gunners who were more exposed to enemy fire than other troops. Generally the soldiers threw the armor away at the first opportunity, as wearing the cumbersome armor in the trenches was of dubious value. 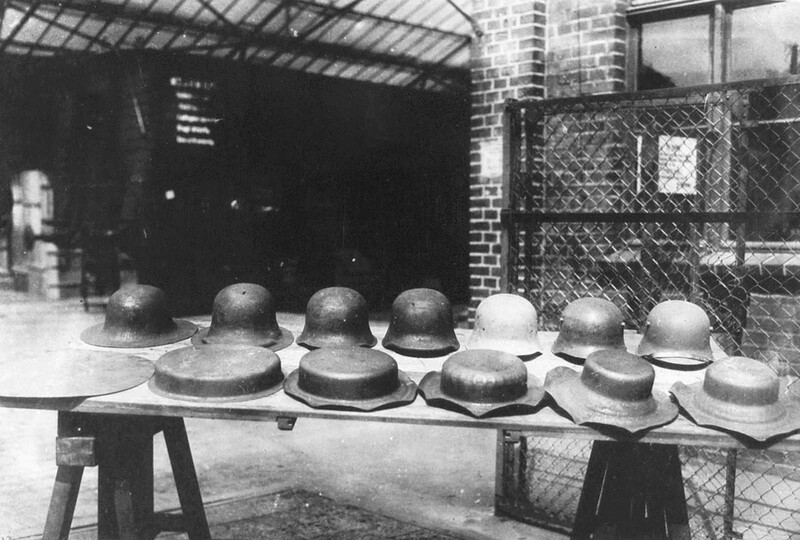 Helmet production commenced in the early spring 1916 at Eis Enhuttanwerk in Thale am Harz. Ten factories joined in the effort to manufacture helmets, and together they produced from 3 500 to 4 000 helmets per day. The total output at the end of the war was 8.5 million helmets. (Photo credit: National Archives/Official German Photograph). I wore the old finnish steel helmet during my time in army in the '70s. It's almost identical to this old German one. Just a comment about the side lugs: the holes in them are so small that they are worthless for ventilation. Also, if it's windy or if one is running, the holes can make a loud whistling sound that is really disturbing. That is why most soldiers blocked the holes with something. So, the lugs just were there without any use, a historical "relic". The old Finnish steel helmet was not almost identical it was actual p16 and p17 German WW1 helmets fitted with new liners. These were all bought by IMA in the USA and are currently on sale at their online store and on eBay. Finnish helmet is more close to WW2 helmet´s than WW1. But yes, we had also WW1 helmets, and hungarian helmets from ww2.. all bit similar but sharing differences. They must have been really heavy to wear. I gather the Brodie helmet was specifically designed to protect from flying shrapnel that would rain down from above, hence the more umbrella like shape. Also it only weighed approximately 0.59kg. The article could have been a bit comprehensive in its explanation of what is simply mentioned as “Japan”!